As a way to express our appreciation to our sponsors and members, we are going to start featuring them here on our website (which we will then share on social media). Today we are happy to introduce our sponsor Advantage B2B, the publisher of Advantage Business Magazine. What does your business do or offer? We are a marketing firm that specifically focuses on b2b. Our clients consist of banks, and professional service firms that want to do business with small and medium sized businesses. We are unique because we own our own media channel. 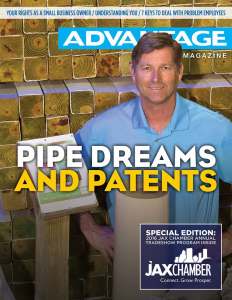 Advantage Business Magazine is a print and online publication that is read by nearly 15,000 opted in subscribers in the Northeast Florida market. What do you love about doing business in Jacksonville? We love Jacksonville because if you do a good job and treat people right, your name gets passed around quickly. There may be no better city in America to start and operate a business. With a river, 3 major interstates, a port and an NFL team, the cards are stacked in Jacksonville’s favor. Our best days are ahead of us.